A depth-based conversion approach demands accurate depth maps for all scenes in the processed video. But obtaining quality depth maps is an extremely difficult task when the scene contains transparent, blurred or out-of-focus objects. 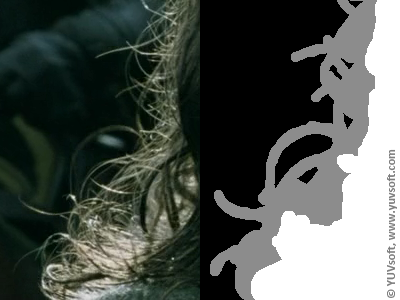 The same difficulty occurs in scenes with highly textured background, hair or fur; most depth-map-generating algorithms produce halos when processing these areas. YUVsoft Matting is an auxiliary tool for stereo and multiview generation. The algorithm constructs a transparency mask for the boundaries around highly textured objects by decomposing the points near those boundaries, which are the mixture of foreground and background objects. Proper division of such pixels provides clear and precise boundaries for textured objects in the resulting stereo. Matting provides a separate foreground and alpha channel, which can enhance the quality of the resulting stereo when used as input for Stereo Generator. The alpha channel enables the correct integration of Matting and Background Reconstruction results, and it maintains transparency on object boundaries. The required input for Matting is the source video along with the depth map and trimap sequences. Trimap is a kind of gray scale image that contains only three colors. Background areas are marked with black, foreground object is white and an area with complex boundaries has gray color. The last ones are usually a mixture of pixels from object and some texture behind it. The auxiliary option enables preprocessing of the input trimap, yielding the filtered trimap as the output. The updated Matting plugin for The Foundry Nuke includes an enhanced interface and several algorithm improvements, which reduce noise on object boundaries and make them appear more natural. The YUVsoft Matting plugin is a component of the YUVsoft Stereo Generation Suite for The Foundry Nuke, a set of plug-ins designed to semiautomatically generate stereo in a manner that fits a company’s resource budget and conversion quality requirements. The Matting plug-in generates clear and accurate stereo even in cases of blurred or transparent boundaries, or of highly textured background in the source frames. Matting generates either the foreground plus the alpha channel or a filtered trimap as output. The filtered trimap can be used for precisely setting parameters. Semitransparent edges processing with Matting – general description of the technology. 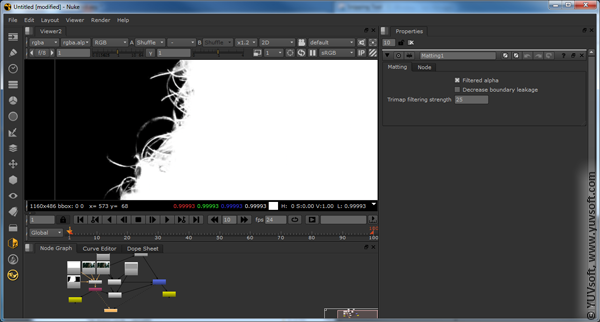 Matting plugin for Adobe After Effects. Depth map dilation – helps to eliminate halos and stripes of wrong color around foreground objects on the resulting stereo video. Background Reconstruction – various methods for different types of video.